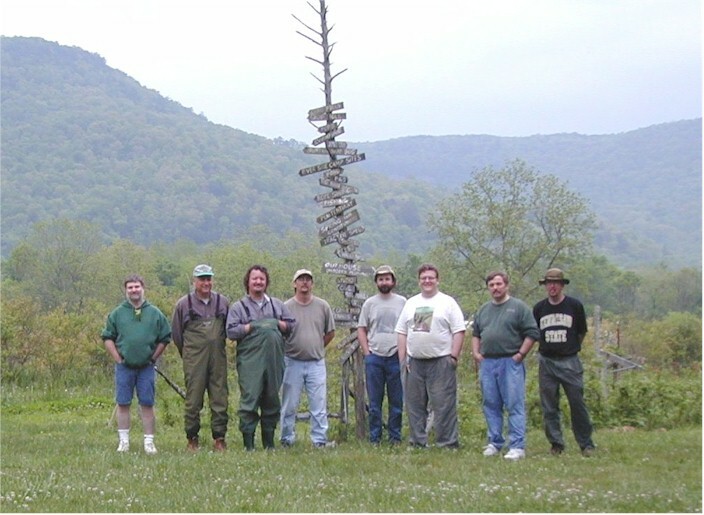 On the afternoon of Friday, April 27, 2002, fishheads began gathering at the Chattanooga home of NANFA TN Regional Representative Casper Cox. Early arrivals were treated to a tour of the cement pond and a leisurely stroll along the stream that winds around his property. After an excellent dinner prepared by the host and his lovely wife, Miss Connie, the group kicked back in the living room and enjoyed a winter collecting video created by Ray Wolff. This work has now affectionately been dubbed "Ray's World." The temperature in Chattanooga was chilly enough to justify the content. 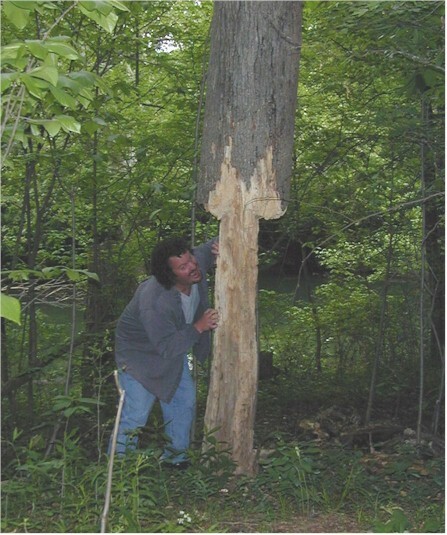 At the stream behind his house, Casper showed us a comical tree that beavers had apparently butchered. Later, as this pic shows, we discovered the real culprit was actually Casper. At the end of the evening, Casper shuttled Ranger Bob Culler, Stott Noble, and Steven Ellis to the spacious guest apartment over his place of business. Klaus Schoening arrived later and spent the night at the Cox residence. Early Saturday morning, the entire group numbered eight people, representing five different states. The party consisted of Stott Noble (Birmingham AL), Steven Ellis (Kennesaw, GA), Klaus Schoening (Cincinnati, OH), Chip Rinehart (West Columbia, SC), Casper Cox (Chattanooga, TN), Mike Whitfield (Chattanooga, TN), Ranger Bob Culler (Kingsport, TN), and Ed Scott (Knoxville, TN). After a fine breakfast provided by the host, they all headed for the weekend lodgings. 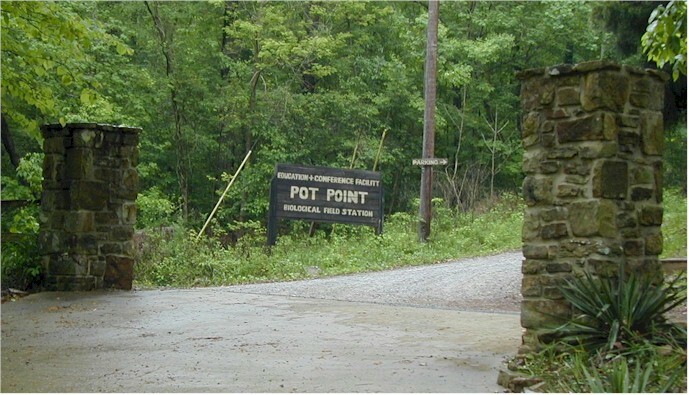 Casper arranged with the TN Trust folks to allow us to rent their cabin on the TN River, called Pot Point. They gave him a special rate based on NANFA's non-profit status. (Your NANFA membership fee saves you money in the long run!). A modern log cabin, the lodge had all of the ammenities the group would need and lots of space. The two large bedrooms upstairs contained five bunks each. The kitchen and large dining room were put to good use! 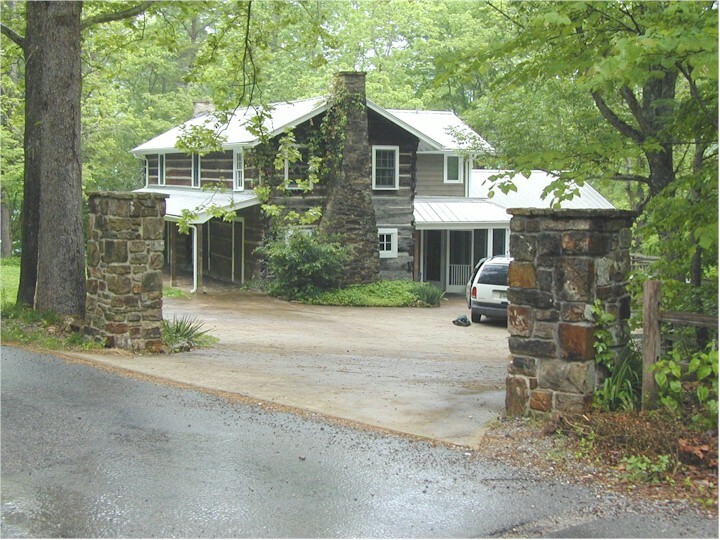 These two pics show the cabin at Pot Point that the TN Trust folks graciously let us rent at a NANFA discount. With all the comforts of home, it was the perfect HQ for this trip. 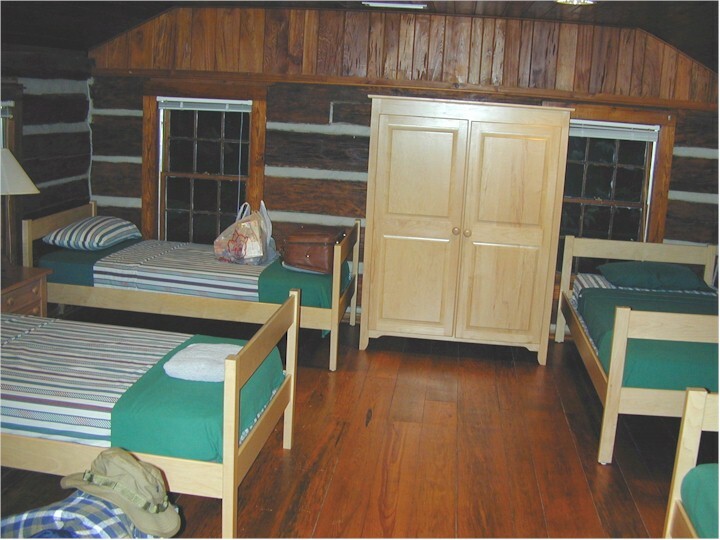 Inside, the sleeping quarters were more than adequate, featuring five bunks in each of the two bedrooms. This was our view of the TN River from the deck of the cabin. The party was only there that morning long enough to drop their gear, and reducing the caravan down to four vehicles, they were off to the first stop of the day. This location is an old ferry where Civil War soldiers were once carried back and forth across the river. 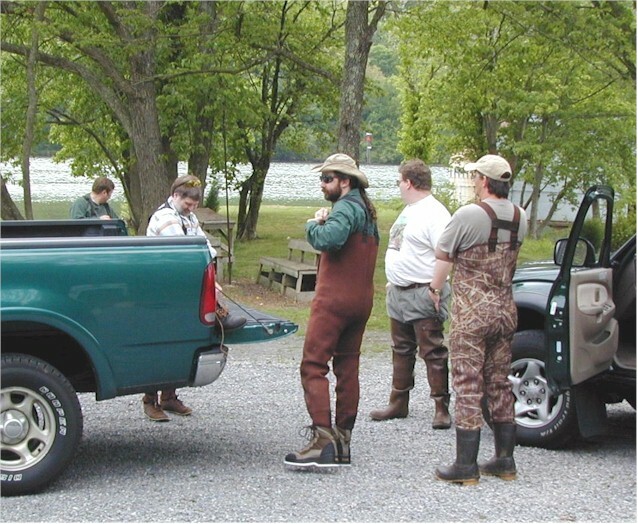 Donning their collecting gear in a church parking lot, the group waded into the shallow water and tricky mud. Chip Rinehart was the first to take a fall. By the end of the day, just about everyone else would do the same. Our first stop on Saturday morning...Kelly's Ferry. This was the cleanest any of us would be all day! L-R: Klaus Schoening (Cincinnati, OH), Mike Whitfield (Chattanooga, TN), Ranger Bob Culler (Kingsport, TN), Stott Noble (Birmingham, AL), and Chip Rinehart (West Columbia, SC). The party got skunked at this second location, but there were some cool ruins that merit exploring at a later date. 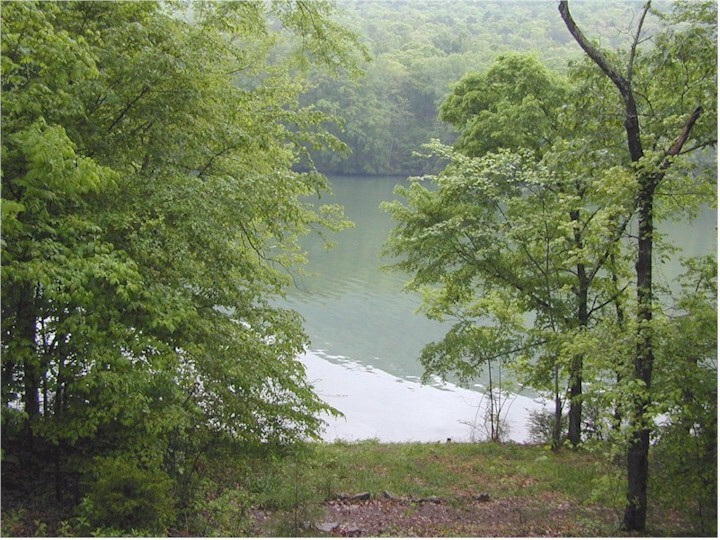 This third site opened off the main body of the TN River, forming a wide creek that backed up into a marsh. Not much was found here until several guys worked their way back to the spring itself, finding rainbow darters as their reward. Steven Ellis was the next to fall, with an over-the-waders plunge. After an unproductive stop at Shake Rag, this was our third location at Ellis Spring. L-R: Casper Cox (Chattanooga, TN), Ranger Bob Culler (Kingsport, TN), Ed Scott (Knoxville, TN), Stott Noble (Birmingham, AL), Chip Rinehart (West Columbia, SC), Klaus Schoening (Cincinnati, OH), and Mike Whitfield (Chattanooga, TN). By this time, the group was ready for lunch. Casper called ahead to the Davis Bait Store where cheeseburgers were cooking as the guys arrived. As the burgers fried, the fish addicts tried to avoid the chilly wind coming off the lake while they sampled the contents of the bait tanks...mostly fathead minnows, called toughies. 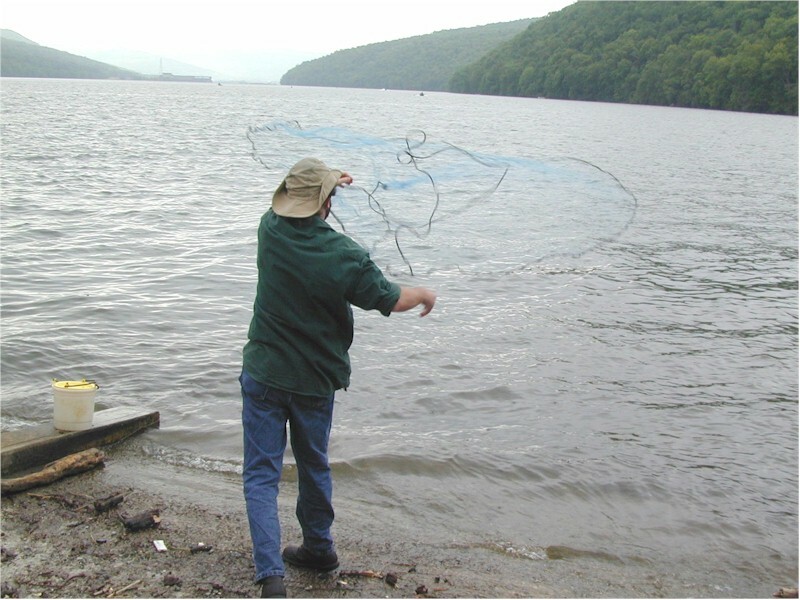 After the meal, Ranger Bob Culler demonstrated the proper way to throw a castnet belonging to Steven Ellis. Prior to this, Steven had only been able to frighten or amuse the fish with this contraption. 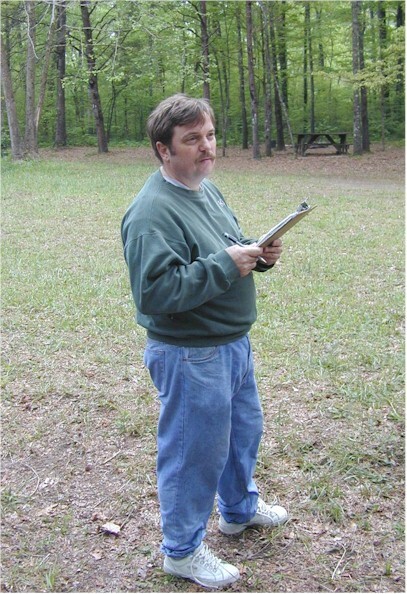 Ranger Bob knew his stuff, and used the net with good results. The steep concrete boat ramp proved a bit too slippery for collecting without bathing, so Ed Scott and Casper walked a short distance to another ramp where it was much easier to pull the seine. 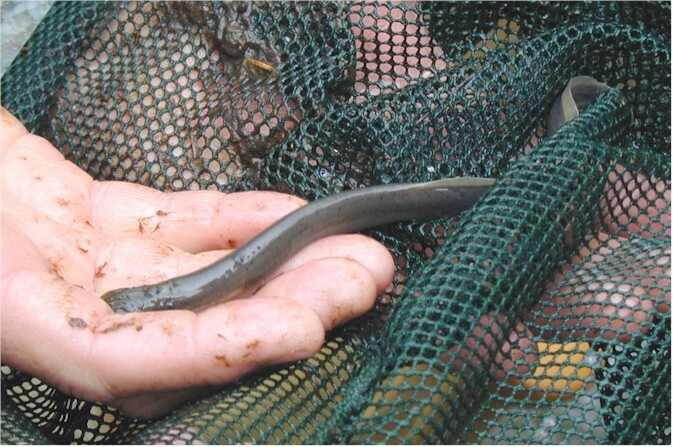 The result was some very large brook silversides. Fulfilling the NANFA intent to educate, Casper paused to show some of the collected fishes to a small boy and his mother and answered their questions. The smile on the little guy's face was worth the trip. We stopped for lunch at Nickajack Lake (Bennett's Ramp on the TN River). 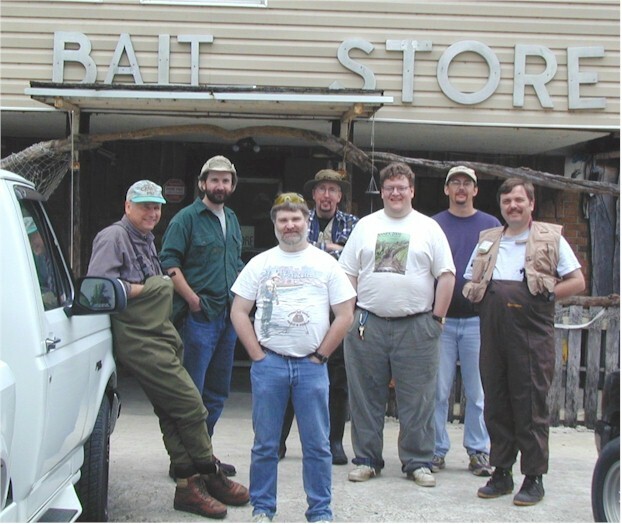 The proprietors of this bait store made the cheeseburgers responsible for the smiles on the faces of these grizzled veteran fishheads. L-R: Ed Scott (Knoxville, TN), Ranger Bob Culler (Kingsport, TN), Mike Whitfield (Chattanooga, TN), Steven Ellis (Kennesaw, GA), Stott Noble (Birmingham, AL), Chip Rinehart (West Columbia, SC), and Klaus Schoening (Cincinnati, OH). Photo by Casper Cox. 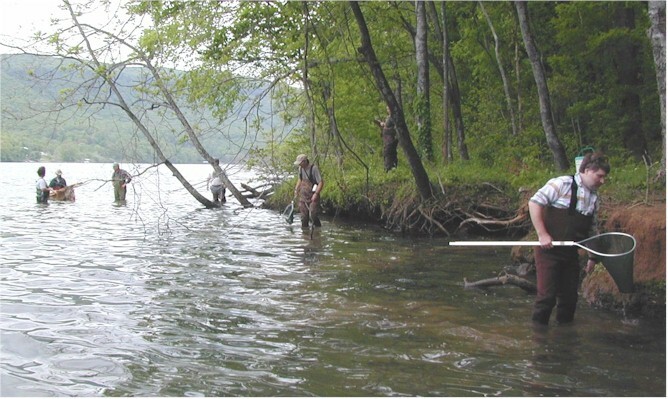 In the Big Sequatchie River at least 21 species were observed/collected. L-R: Casper Cox, Ranger Bob Culler, Ed Scott, and Stott Noble. Until many feet entered this water, it was crystal clear and unbelievably cold, conducting a chill even through insulated waders. It figures, then, that this would be the site where many would take their turns at falling in the water. Klaus Schoening nearly recovered as he tipped over, but the current pushed him down. Nobody can top Mike Whitfield's dive, however, as he completely submerged after stepping into an underwater abyss. The intention at this location was to gather enough sculpins to cook that evening. That goal was achieved rather quickly by kicking them into the seine. The frigid waters of Sequatchie Spring Run yielded up many mottled sculpins that were destined for a midnight snack later that night. Photo by Klaus Schoening. The final stop of the day was a section of the Little Sequatchie River that wound its way through the farm of Mr. Jim Wright. The farm itself was impressive enough, a family run operation that has passed through the generations down to the Keeners who work it now. It features cattle, hogs, sheep, chickens, ducks, geese, as well as fresh veggies, grapes, and excellent mushrooms. Mrs. Keener, whose specialty is the propagation and sale of native plants has an enviable greenhouse at the edge of the woods. In the days of corporate farming and commercialization, it is very rewarding to meet a family that is happy living a traditional agrarian existence. Situated at the base of a towering ridge, and beside a pleasant, clear running stream, they have a semi-paradise in which to make their living. At the Little Sequatchie River Ed Scott (at left) and Mike Whitfield try their luck at hook 'n line fishing. However, it was Ranger Bob (not pictured) who brought in the "eatin' size" catch of rock bass and rainbow trout. At the last site of the day, Klaus Schoening polled the group to complete the species list. This important function leaves a paper trail for future collectors. 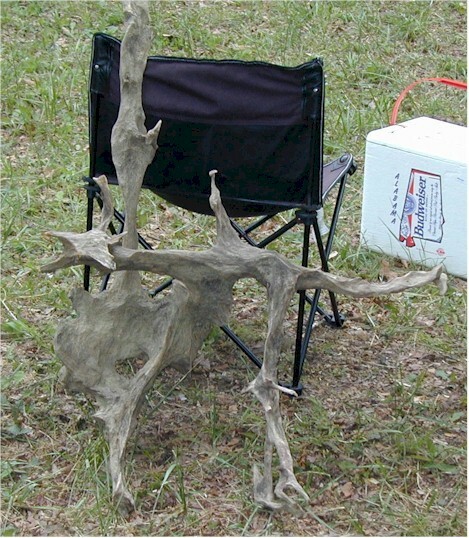 Stott Noble topped all other driftwood collectors of the day with this magnificent piece from the Little Sequatchie. The stream itself is very nice, although the bottom is lined with round, slippery stones. It can be easily navigated, just not quickly! 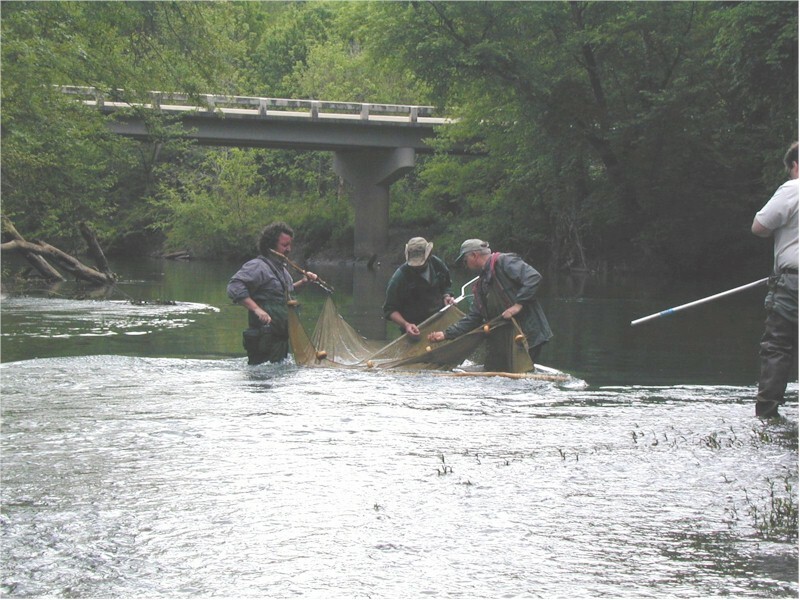 Because of this, most of the fishes were taken with dipnets in the riffles. These riffles were absolutely loaded with colorful darters and juvenile sculpins. Exploring a nearby spring, Stott came away with a fabulous piece of driftwood suitable for a mantlepiece. Ed, Mike, and Ranger Bob all tried their hands at hook 'n line fishing. Ranger Bob brought in a couple of keepers for dinner. Steven Ellis had intended to snorkel at this location, but the water temperature was only running between 56 & 58F! Despite Casper's encouragement, the GA boy just wasn't going for it. 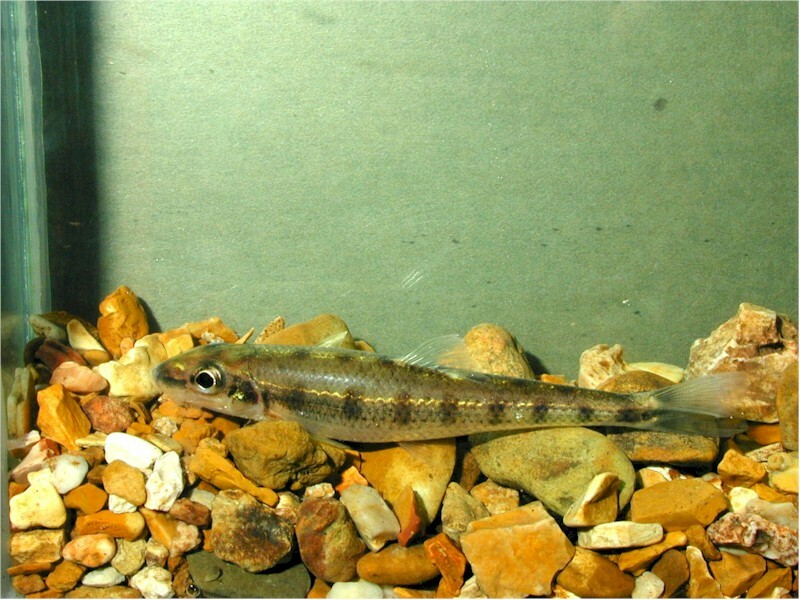 A sawfin shiner from the Big Sequatchie River. Photo by Klaus Schoening. A blotched chub from the Big Sequatchie River. Photo by Klaus Schoening. On the way back out, the group stopped at the farm to purchase fresh eggs & 'shrooms, visit Mrs. Keener's fine array of plants, and chat with Mr. Keener about his farm. He was duly impressed with the darters Casper showed him and shared a copy of the farm newsletter. He also agreed to take a couple of group photos beneath his cartoonesque sign post that pointed every which way. We ended the day of collecting at an excellent farm owned by Mr. Jim Wright. Mr. Keener agreed to take this group photo of us by a homemade sign post with directions to just about anywhere. L-R: Mike Whitfield (Chattanooga, TN), Ed Scott (Knoxville, TN), Casper Cox (Chattanooga, TN), Chip Rinehart (West Columbia, SC), Ranger Bob Culler (Kingsport, TN), Stott Noble (Birmingham, AL), Klaus Schoening (Cincinnati, OH), and Steven Ellis (Kennesaw, GA). Happy and exhausted, the collecting party made the long drive back to the lodge. A thoroughly soaked Mike Whitfield bid the group farewell at this point and headed home. To Mike's credit, he is the gentleman responsible for introducing Casper to NANFA. (Thanks, Mike!). The lodge quickly became a flurry of activity as fish coolers were stashed on the porch, viewing tanks were set up in the living room, and a couple of folks sneaked in hasty showers. While the wandering fishheads were in the field, Miss Connie had been busy preparing a wonderful, tasty supper. If anyone went away hungry, it was their own fault! As the group feasted, the Cox children chased a huge green moth through the lodge. Can there be any dinner music more delightful than the laughter of children? The evening was very relaxed. Waistlines expanded, beer appeared, and fish tales were swapped. Oddly, the evening hours were the warmest it had been all day. Still, Chip's campfire was more than welcome. The stories grew along with the shadows. Ranger Bob once again worked his magic, tricking the photocell that controlled the exterior lights with a flashlight. Once the lights were out, the campfire regained its proper appeal. A few folks retired early (midnight), and missed Ed's dish of sculpins, rock bass, rainbow trout, and telescope shiners. Back at the lodge, several folks came up missing after dinner. I found them out back trying to burn Casper at the stake, in a little-known NANFA ritual called "Roast the Host." Just kidding...it's a crop of the next pic, where Chip demonstrates his pyro skills. 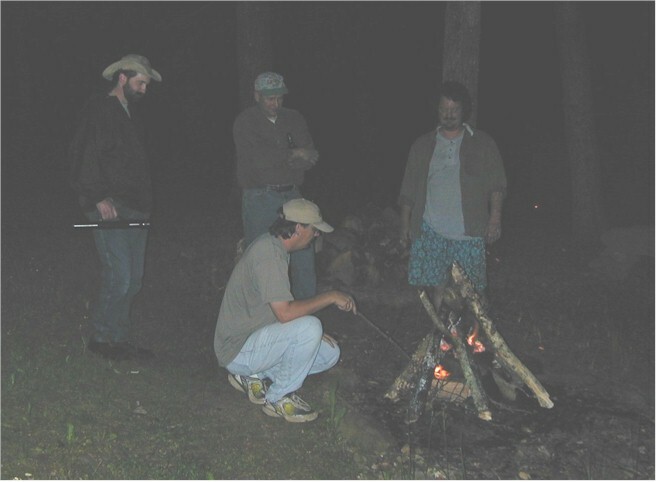 L-R (standing): Ranger Bob Culler, Ed Scott, Casper Cox watch Chip Rinehart make a good campfire. Seriously I want to "Internetily" thank my wife Connie for feeding a bunch of ravenous fish mongers. She took care of us Friday night with me manning the grill, Saturday morning's breakfast and the Saturday night extensive buffet. I think she is a real keeper :) I don't know if she will do it again though... so keep those post cards a coming! The typical sunfish: Red Breast, Longear, no Rock Bass this time, maybe Greens. 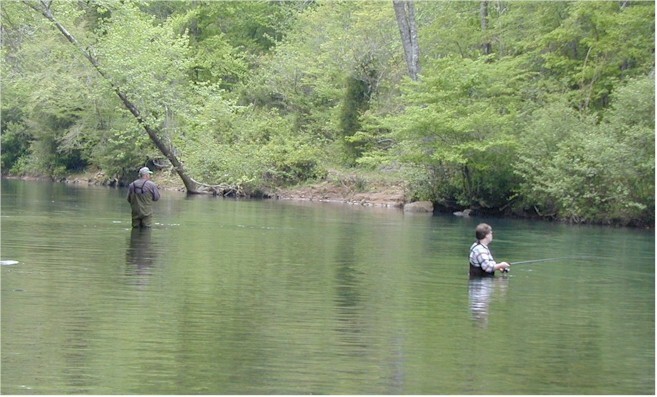 South Chickamauga is a big flowing creek which has a lot of diversity in it. It flows through a lot of North Georgia farmlands, being fed from a multitude of springs and mountain streams. Unfortunately the water stays green most of the year and I've only been able to snorkel it 2 or 3 times, and in all cases visibility has only been about 3'. I was able to bring home a few of the Spotfins, Bigeyes, River Chubs and Longears. These I put into the great experimental cement pond and observed them again last Sunday along w/ the enormous Silversides we had collected in the Tennessee River. 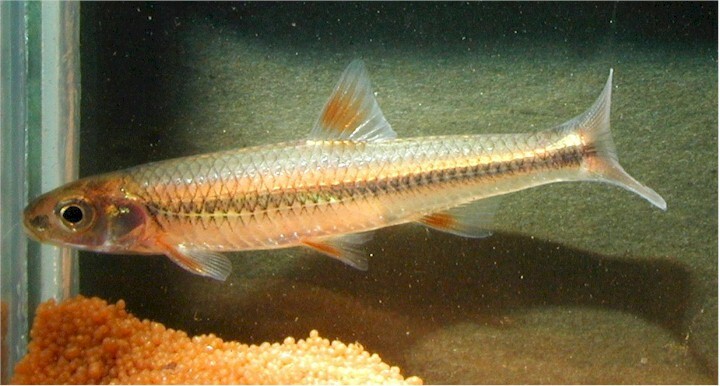 I'm quite pleased to see the Silversides being they are so fragile. 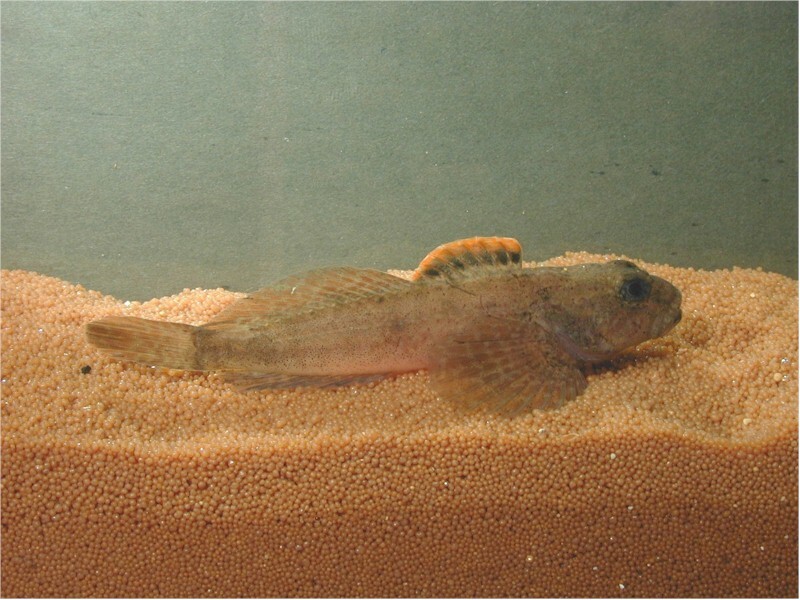 It's a very cool fish to observe while in their new habitat. Stott brought me a bucket of plants and I had collected a few more on our foray. These I added to the various pools scattered in the yard. Spring has been good and most everything is flourishing. The cement pond seems to cycle in algae blooms and visibility. If I stir up the gravel even slightly there is big green bloom but after a few days it clears rapidly. Hopefully through the summer I will be able to continue to observe this mini habitat. We all said our good byes over drinks and Moon Pies and left for our respective homes. I think we all had an excellent time according to the rumors. I want to thank Chip for being our Camp Fire Master, Klaus for being the head species lister and photo snapper, Steve for his photos and trip report and constant badgering me to amend it, Ed for his fine culinary skills and ID expertise, Ranger Bob's trash dipping composting which stopped just short of Cyan's diapers, and Stott's aquatic plant dispersal. Also a thank you to the Keeners, the TN River Gorge Trust, land owners and God for making such a wonderful creation to enjoy and keeping us safe and joyful. I'm already considering Seinerama II in 2003... the cabin is so nice and a perfect place for a fishhead gathering. There is another direction and waters to explore and by adding Friday and Friday night we could further enjoy its amenities. Being we had 8 this time I think we could accommodate up to 12 of us comfortably next time. We could have another evenings of videos (which by the way I want to thank Dr. Bill Roston for sharing his excellent videos with us Saturday night) and maybe a lecture or two. And certainly some extended cooking lessons via a la fondue. I'm working on the TeePee Fisherie for late June, and I still have a few details to work out-- mainly getting the teepee setup on a weekend without conflicting with sweating naked white people doing Indian ritual cleansings. Let me know if you're interested. I want to do a prescout of some sites if anyone would like to help, so let me know. Ranger Bob has a excellent opportunity to share his region. A tour of his aquatic facility at the Kingsport city park, staying in an old house next to a creek and exploring his part of NE Tennessee. It sounds really great Bob! Get a plan and a date because a bunch of us are hankering to visit! And finally I'm sorry for skunking us in the Tennessee River. Even though the first site was somewhat productive the others... well I had no intentions on losing any body to mucky quicksand and the pickings were way to slim and with the turkey hunters keen on getting their Thanksgiving meal... the river gave us little but a view.